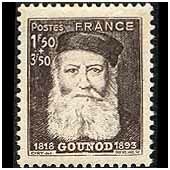 Charles Gounod, due to his fame, was quite naturally very often painted, drawn and photographed. Reknowned painters executed his portrait among whom, Édouard Dubufe, his brother-in-law, but also Ingres, Lehmann, Delaunay and Garnier. Caricaturists also drew him, and notably Étienne Carjat. Photography existing already, we have the chance to discover the extraordinary charisma of the composer. By clicking the photography below to the left, you will reach a list of pictures, which you will then be able to see in full screen. By clicking the picture below on the middle, you will reach a list of paintings and etchings, which you will then be able to see in full screen. By clicking the picture below to the right, you will reach a list of Gounod's goods, which you will then be able to see in full screen. Enjoy your visit through this collection of portraits.